The phenomenal success of integrated product and process development (IPPD) at such companies as Boeing, Motorola, and Hewlett-Packard has led many manufacturers to place renewed emphasis on this critical aspect of concurrent engineering. If you are among those charged with the daunting task of implementing, upgrading, or maintaining IPPD, you need a single reference/handbook that covers all of the tools, technologies, and applications that support IPPD. You need Integrated Product and Process Development. Emphasizing applications, this extremely user-friendly guide covers everything from basic principles to cutting-edge research. It addresses ideas and methods in product design as well as issues related to process design and manufacturing. Case studies illustrate the application of various tools and techniques of IPPD in manufacturing for the defense industry, making the most of product planning, applications of quality function deployment (QFD), the effective use of design optimization, and integrating design and process planning. Identifying customer needs using QFD. Issues and constraints in time-driven product development. Enhancing automated design systems with functional design. John M. Usher received his Ph.D. in Engineering Sciences at Louisiana State University in 1989. He also holds graduate degrees in both Chemical and Industrial Engineering from LSU, and a bachelor's degree in Chemical Engineering from the University of Florida. Utpal Roy is the editor of Integrated Product and Process Development: Methods, Tools, and Technologies, published by Wiley. Hamid Parsaei is the editor of Integrated Product and Process Development: Methods, Tools, and Technologies, published by Wiley. Identifying Customer Preferences in Quality Function Deployment Using Group Decision-Making Techniques (Y. Lai, et al.). Functional Design (T. Beng, et al.). Time-Driven Product Development (M. Hundal). An Integrated Data Model of Function, Behavior, and Structure for Computer-Aided Conceptual Design of Mechanisms (W. Zhang, et al.). A Web-Based System to Enhance IPPD by Automating Designer Communication and Data Access (J. Bailey & R. Rucker). Rapid Prototyping and Manufacturing: The Essential Link Between Design and Manufacturing (C. Chee-Kai & L. Kah-Fai). Case-Based Process Planning for Three-Dimensional Machined Components (M. Marefat & J. Britanik). 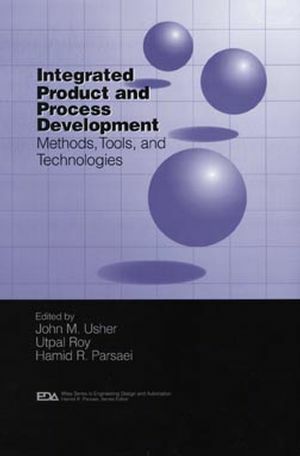 An Integrated Methodology for Product Process Development in Automated Manufacturing Control System Design (F. Cheng & E. Hall). A Graph-Theoretic Approach with Fuzzy Critique to Manufacturing Diagnosis (K. Li-Pheng, et al.). Integrated Processes in Defense Manufacturing (G. Shumaker & R. Thomas). Anticipating Manufacturing Constraints and Opportunities in the Concept Generation and Product Planning Phases (R. Verganti). Effective Product and Process Development Using Quality Function Deployment (R. Verma, et al.). Design Flow Management and Multidisciplinary Design Optimization in Application to Aircraft Concept Sizing (B. Wujek, et al.). Integrated Design and Process Planning for Microwave Modules (J. Herrmann, et al. ).